Drafting Patent License Agreements, Eighth Edition illustrates the growing importance of intellectual property transactions to business and the resulting attention these transactions receive in legislative, regulatory, and judicial areas. This newly released edition will help you understand all the legal issues affecting patent license agreements – and how to easily incorporate them into every transaction you handle. The new Eighth Edition has been completely revised and expanded to reflect vital legal developments. It presents a current overview of all legal issues surrounding licensing, including patent exhaustion, antitrust, bankruptcy, Bayh-Dole, and export control. Also included are new chapters on the UCC and RAND licensing. 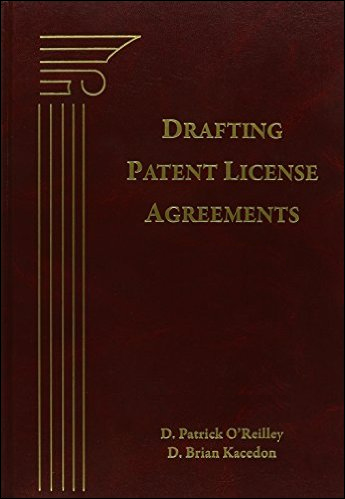 In concise chapters, Drafting Patent License Agreements, Eighth Edition tracks and discusses — clause by clause — all the critical components of a license agreement. This newly updated reference provides you with a current overview of all legal issues surrounding licensing, addressing every typical provision used in patent and know‑how licenses. Sample provisions are provided with references to applicable legal and practical consequences. Ericsson Inc. v. D Link Systems Inc.
Jaffe v. Samsung Electronics Co.
Microsoft Corp. v. Motorola Inc.
is Included With Your Purchase! This comprehensive desk reference includes a link that provides access to a set of form paragraphs and clauses you can incorporate into your license agreements. Form paragraphs are indexed to the text, and each one includes the rationale and legal support so you can determine whether or not a particular form paragraph is appropriate for accomplishing your specific goals. This valuable online access also includes the form agreements contained in the appendices. Technology Transfer Tactics is proud to partner with Bloomberg BNA Books to bring our customers access to this comprehensive and authoritative resource. The high-end content in Drafting Patent License Agreements, Eighth Edition is designed to meet the specialized needs of today’s busy IP law and licensing professionals. Dennis “Pat” O’Reilley, a partner with Finnegan, Henderson, Farabow, Garrett & Dunner, LLP, has extensive experience in assisting clients with transactions involving transfer of intellectual property rights. He represents clients as licensors and licensees, and negotiates and drafts agreements ranging from simple licenses to complex collaboration agreements. He has written many articles on licensing and related issues, taught licensing law at George Mason University Law School, and is active in education and leadership positions in the Licensing Executives Society. Brian Kacedon has extensive experience with Finnegan, Henderson, Farabow, Garrett & Dunner, LLP, in patent and technology licensing as well as patent litigation. He assists clients in all aspects of licensing, including establishing licensing programs, developing licensing strategies, and negotiating and drafting license agreements. He has considerable experience in developing and implementing programs for licensing pooled patents directed to standards. He frequently lectures at legal and industry conferences on licensing issues and serves as Adjunct Professor at George Mason University Law School.